(CNN) -- Feeling sluggish after a few too many eggnogs and a halt to your fitness routine? 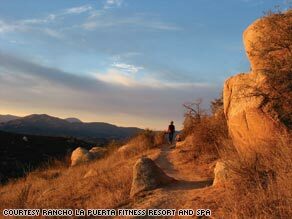 Rancho La Puerta, in Baja California, Mexico, offers organic cuisine, fitness classes and spa treatments. January can be a bleak month to get rolling on those resolutions, so perhaps you need a little spa getaway to recover from the holiday revelry and get yourself pointed in the right direction for 2009. CNN asked Mary Bemis, editor-in-chief of Organic Spa magazine, to recommend five places to unwind and detoxify after the busy holiday season. This unpretentious spa on the tip of Montauk boasts a stunning waterfront location in the Hamptons, but it's how this spa uses seawater that sets it apart. "They are one of the only true spas in North America to offer thalassotherapy, which is highly detoxifying," Bemis said. Thalassotherapy uses mineral-rich seawater and seaweed to enhance good health. Day visitors to the resort can purchase a pass for $30 to gain access to the Russian steam room, the Finnish rock sauna and indoor heated seawater pool. A full menu of spa treatments is available, including a seaweed wrap or seawater hydrotherapy massage, each for $75. The combined 90-minute Marine Kur therapy, which includes exfoliation, a powerful shower that stimulates nerves, a massage performed while the client is immersed in a tub of 94-degree seawater and a full seaweed body wrap, runs $220. The 110-minute Ultimate Detox treatment uses clay mined in northern France rather than the seaweed in the sequence above for $285. This destination spa nestled among the red rocks in Ivins, Utah, offers a full lifestyle package. "If you really want to make a life change and you really want to learn how to not only detoxify, but eat better, exercise, it's a great program," Bemis said. While there are some day treatments, only overnight guests can take full advantage of the spa's many programs, including guided hikes and wellness classes. Through February 28, the spa is offering rates starting at $199 per person, per night, which includes accommodation, three meals daily, unlimited fitness classes, guided hikes and other programs. This luxurious oceanfront spa offers a beautiful setting, delicious spa cuisine and a range of relaxing and restorative treatments in both indoor and outdoor facilities. "This is a very high-end, lovely experience," Bemis said. The staff will customize treatments to a visitor's particular needs and will show guests how to maximize the benefits of the spa's water circuit. The 60-minute Art of Spa treatment, which uses water at different temperatures to help the body balance itself, is $190. "You're using heat and water to detoxify yourself. So you're spending, say, 15 minutes in the sauna or the steam room and then you come out and do a cold plunge," Bemis said. This cycle is repeated several times for maximum effect. Check into the resort for one or more nights of luxury, or gain access to the spa, spa pool and the lounge areas, stream room and sauna with the purchase of a 60-minute spa treatment. La Playa resort guests can enjoy a range of treatments at the intimate SpaTerre, right on the Gulf of Mexico. The spa offers a menu of Global Rituals, including a volcanic earth clay treatment (80 minutes, $220) that includes a detoxifying volcanic clay body mask, a Balinese foot massage, an aromatic shower and a traditional Balinese massage. Bemis enjoys the option of adding a Japanese soaking tub ritual before or after a massage. Fresh flower petals and aromatherapy essence are added to the soothing soak. Bemis calls this spa, which is in a sheltered valley an hour's drive from San Diego, "the great-grandma of all destination spas." Founded in 1940, Rancho La Puerta welcomes guests from Saturday to Saturday, providing a full week to reset and learn about healthy living. "It's a beautiful location, they have organic gardens and organic food. It's just set up to really take stock of your life and to change what needs to be changed," Bemis said. Doubles start at $2,795 per person for the week, including all meals, guided hikes, fitness classes, evening programs and transportation to and from San Diego International Airport.